Each summer the hotels of Puerto Vallarta welcome some special guests to their beautiful beaches. And though you might never see these guests in the tabloids, they're certainly celebrities in their own right. Each year, the arrival of summer means it's time for the resorts' annual baby sea turtle release events. As the warmth of July draws beachgoers to the resorts, the annual arrival of the Olive Ridley Turtles also begins. Drawn to their birthplace, the marine turtles make the trip back home to nest and lay eggs. Though the annual appearance of the turtles has now become a celebrated event, their arrival also signifies something more. It marks the beginning of a concerted conservation effort to preserve one of the most vulnerable species within the area. The marine turtle as a whole is a rather small subset of creatures with only eight different species found worldwide. This makes the situation facing marine turtles especially difficult. With so few species, the threat of complete extinction is far more real than that of other reptiles. This situation is made even more precarious when the nature of marine turtles is explored. Given that marine turtles need to lay their eggs on land and have a proclivity for returning to their places of birth, any disturbance of their natural breeding ground could severely impact the species as a whole. And this is very much the case for Puerto Vallarta's local turtles as well, the Olive Ridley turtle. As the Olive Ridley only breeds in a few locations, they depend on these beaches, quite literally for survival. This has to lead to a few problems in the past. As their main breeding ground is surrounded by resorts, the risk of disturbed nests was quite high. Though, thankfully the resorts were able to work together with conservationists to rectify that problem. 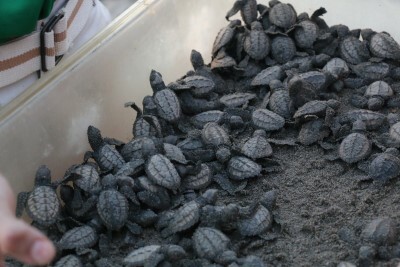 Their combined efforts would eventually become the baby sea turtle release program that many enjoy today. As of writing the piece, the success of the conservations efforts has led to a steep increase in the number of baby turtles that are able to make it back into the ocean. 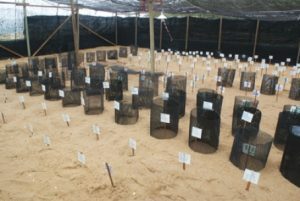 Before the hotels' efforts, only 40% of newly laid eggs were ever given a chance to develop. 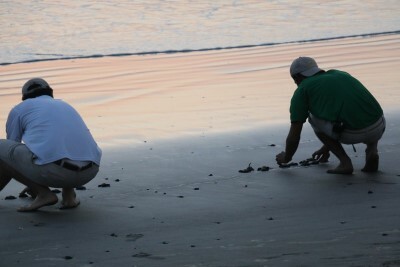 But thanks to the hotels' programs, nearly 96% of the Olive Ridley Turtle eggs buried along the coastline fully mature. For those of you who would love to experience the beauty of the release in person, you're in luck. While the best times to see the release are between July and December, you can still find a few programs even in March. Personally, we were able to participate even as late as February. 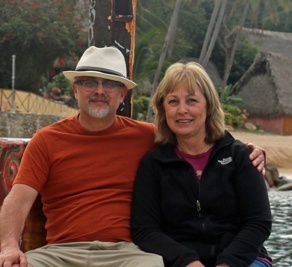 Though, it was right after our grandchildren left after vacationing with us at the Grand Luxxe Nuevo Vallarta. So needless to say, we were all a bit bummed they couldn't join. But none the less, it was an amazing experience to witness. They would set out to watch for nesting turtles paying attention to locate fresh nests. Once they spotted a few, they would begin gently removing the eggs and prepare them for their new temporary home. Once the staff would collect all of them, they would then place the eggs in little cages back within the resort. This helps keep the eggs safe from tourists' feet and hungry predators. Once the little ones hatch and are ready to set out to see, the real beauty begins. n bidding goodbye to the newly born Olive Ridley Turtles. 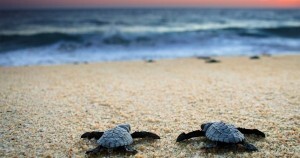 As to best protect the baby sea turtles, they have to be released at sunset to avoid predatory birds. So each sunset, guests can release the little ones right at the water's edge as they prepare to journey out to sea. And believe, it really is something you have to experience to fully appreciate. Seeing the tiny turtles swim against the waves until they disappear out to sea leaves you with a sense of awe. Though it isn't heavily advertised, you can experience the release yourself during your vacation. Just simply ask around at the hotel to find out the details. And if you can, definitely set aside some time to join the release each evening. It simply is one of those things you have to experience while staying in the resorts. If you would like to see the little turtles up close, by all means, head over to our booking page to book your vacation today! But the turtle fun doesn't just stop there, for those that can't get enough of the cute shelled creatures, head to Akumal Bay. There, you can swim alongside adult sea turtles returning from the open waters to feed and rest along the coastline. It's a chance to see their entire life cycle play out before you in one single trip. Which gives you opportunity to fully appreciate the beauty of these quiet locals.